There are two references to ‘Cachalot’ in the Lloyds Register of Yachts (1936). One is the well-known ketch built in Brixham the previous year, the other is a steel-hulled vessel from 1911. 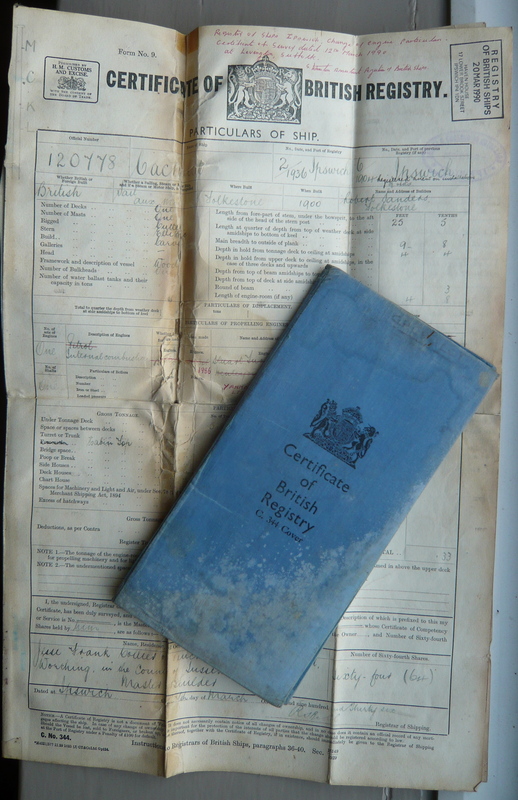 Neither being our ‘Cachalot’, we now turn to her Certificate of British Registry. The hardcover ‘blue book’ unfolds to reveal handwritten records from 1936 to 1991. ‘Cachalot’ was owned by two stock brokers; Herbert Charles Norton: Stock Jobber from Amersham, Bucks., and Hugh Leycester Bedwell: Stock Broker from Warwick Square, London from 1936. These same two owners are listed in the Lloyds Register of Yachts (1937-39), along with reference to a petrol engine, Stuart Turner, 2 cylinder. The Lloyds Register was not published during the war years, and in 1947 we find she is listed as owned by Hubert Somervell, living at 97, Clifton Hill, NW8, still with her Stuart Turner petrol engine.There is also a gap in the Certificate of British Registry from 1939 and Hubert Somervell is not listed as an owner. So when did he purchase her? 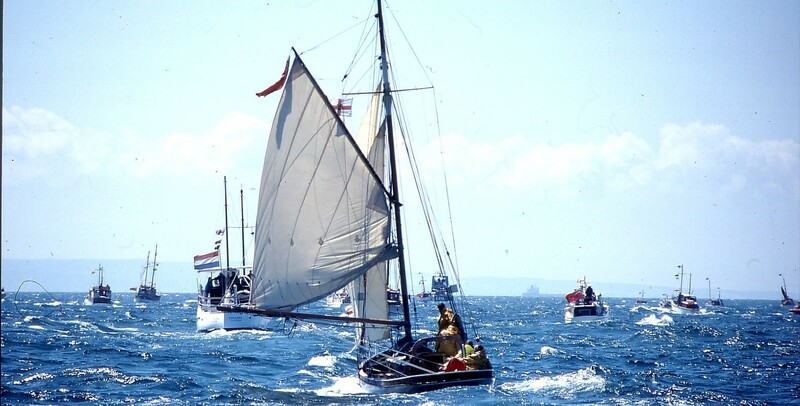 ‘Cachalot’ is a member of the Dunkirk Little Ships Association and listed amongst the vessels requisitioned to assist in the evacuation of Dunkirk, but there is no record of her activity there. 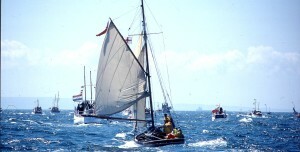 She has taken part in events run by the ADLS, including the 1990 ‘Return to Dunkirk’. Hubert A. Somervell enlisted as a midshipman in 1916 and is listed in the London Gazette on three occasions (1918, 1920 and 1921) as a Royal Navy Lieutenant [retired in 1921]. In 1939, Hubert A. Somervell is living at 10, Fishpool St. London, now a Clerk in Holy Orders. Is this the same man who owned her when she was taken to Dunkirk? Kenneth Albert Harwood: Opthalmic Optician and Neauer Messinger: Shopkeeper, both of Guildford, Surrey are listed as joint owners from November 1948 until Brigadier Edward Elwyn Nott-Bower purchased her in 1951. These two owners are also listed in the Lloyds Register of Yachts (1949-51). Between 1928 and 1931, two ladies are listed as owners in the Lloyds Register of Yachts: Mrs Ellen Margaret Stubbs of Leigh-on-Sea and Mrs Florence E Oliver of Coventry. There is no record for ‘Cachalot’ in the Lloyds Register of Yachts between 1932 and 1936. 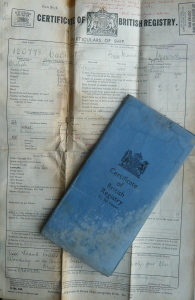 The first entry in the Certificate of British Registry lists Jesse Frank Collier, Master Builder from Worthing, Sussex as the owner in 1936. The Certificate also refers to an auxiliary petrol internal combustion engine, 1934, Stuart Turner, 2 cylinder, 6hp. We assume this to be her first auxiliary engine.